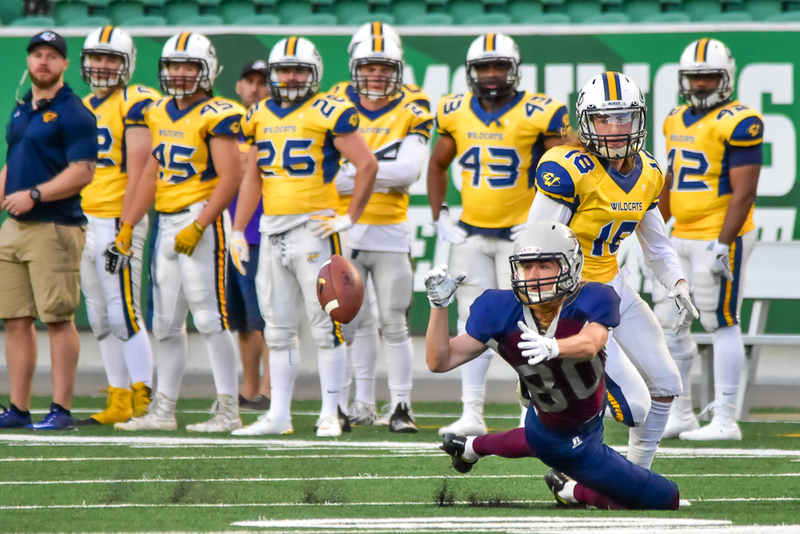 REGINA - Sawyer Buettner threw for 221 yards and three touchdowns and the Regina Thunder routed the Edmonton Wildcats 55-7 on Saturday night to even their record at 1-1 on the PFC season. The Thunder started fast, leading 14-0 after the opening quarter. They upped their lead to 24-0 at the break and carried a 55-7 advantage into the fourth at Mosaic Stadium. Kris Calcutt led all Thunder receivers with 87 yards but didn't find the endzone. Regina's aerial TDs came from Levi Paul, Jesse St. John, Jh'Quinn Swan and Kellen Henry. Scoring rushing majors were Ethan Hautz and Tristan Lockman. Hautz had 120 yards rushing on the night. Penalties were disgusting. Edmonton took 25 for 229 yards while Regina was undisciplined as well, earning 19 flags for 190 yards. The Thunder will visit the Hamilton Hurricanes next Saturday. WOW.... 39 Penalties in this game!!! That has to be one of the most penalized games in Junior Football History. There is between 60-70 plays in a game. To see the hot pink nylon on the carpet 39 times would mean that 3 out of 5 plays would have been penalized. That's just way too much. Flag happy officials have ruined games in the past. That wasn't the case here. However, Insignificant calls had to have been made. I just can't see both teams being that far off. Hope the film helps the officiating to keep the penalties down going forward. SK Football Fan in the Queen City. You missed the special teams TD scored by Parker Dawson on a blocked punt recovered in the end zone. Baffles me every year how the 2 teams from Edmonton are always so bad.